Democrats continue to sling mud with regards to the Trump administration’s zero tolerance immigration policies and attempt to distract the American people from the damning revelations in the recent release of the Inspector General’s report. 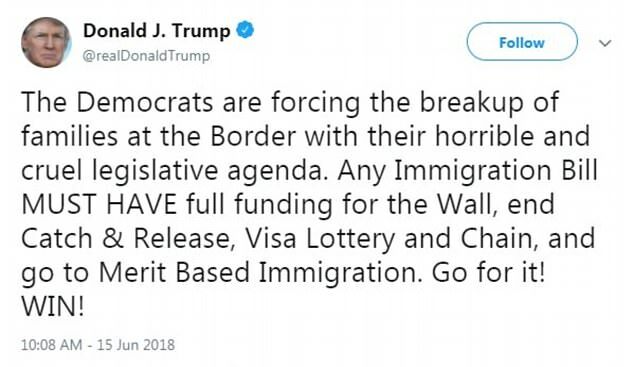 Not one to mince words or suffer fools, President Donald Trump effectively places blame back where it belongs – on the shoulders of the globalists on the left and the right with their “open borders” policies in direct opposition with American laws and what the American people want. 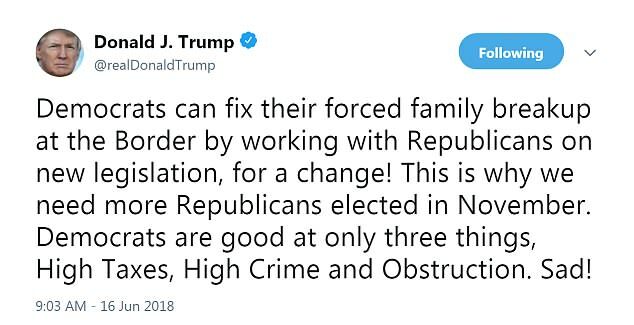 President Donald Trump blasted Democrats via social media, making it clear who he believes to be to blame for families being separated at the border. He states his administration is merely following the rules established by the Obama administration. President Trump has a point and the policy goes back even further than Obama to the George W. Bush administration. Implemented in 2005, Operation Streamline was the launched by the Bush administration in Texas’ Del Rio border sector, aimed to increase immigration prosecutions in response to an uptick in non-Mexican border crossers. According to MigrationPolicy.org – “Between 2003 and 2005, criminal prosecutions of first-time unauthorized crossers for illegal entry more than quadrupled, from 4,000 to 16,500. By 2010, they had reached 44,000, an 11-fold increase from 2003, while prosecutions for other immigration charges increased just 9 percent (excluding illegal re-entry, which tripled in that time). Previously, CBP had mainly referred for prosecution migrants who had prior criminal convictions or those suspected of smuggling. Almost 2,000 children have been separated from 1,940 adults between April 19th and May 31st. These adults attempted to enter the United States illegally between official border crossings, according to Homeland Security statistics. These parents continue to place their children in danger by choosing to illegally cross American borders. Some of these adults are using these children in an effort to play on the sympathies of Americans. It seems the progressive left is doing everything in their power to keep things stirred up and deflect blame from their own failed policies and outright criminal activity as the 2018 midterm elections are quickly approaching. They do not have an issue or a leg to stand on so they must manufacture controversy. We are not trying to keep illegal aliens from becoming American citizens. They are welcome to do so. They would be welcomed with open arms if they would simply come to our nation the right way. Many others have done so. They are not super special to bypass our laws. We are a nation of laws and if we simply selectively enforce them or cease to enforce them at all, we will quickly become a third world nation. One only has to visit the sanctuary cities of Los Angelos and San Fransisco to see exactly why leftist open borders policies are terrible for the American people and for the nation as a whole. President Trump is effectively trying to prevent the rest of the nation from becoming like the failed state of California. His zero tolerance policy is being enforced in order to maximize criminal prosecutions of people caught trying to enter America illegally and deter others from attempting the same, as well as attempt to prevent repeat offenders. The consequence is more adults being jailed while waiting for trial and children having to be removed from them. He went on to claim that if the left side of the aisle would “sit down instead of obstructing, we could have something done very quickly” about the migrant situation. The changes will send a strong message to all migrants traveling to the border without prior authorization to enter—including those who plan to cross illegally to apply for asylum—that they will not be welcomed into the United States. Meanwhile, the moves will likely add to the backlogged immigration caseloads of the federal courts in border states, further strain the limited capacity of the immigration detention system, and face legal challenges. They also could potentially divert migrants to ports of entry, where the new changes do not apply, adding more traffic to already-bustling official crossings. However, years of porous borders and lax enforcement have led to this issue. It will not be repaired overnight. Prior to the enforcement of this policy, people who were accused of entering the United States illegally without a criminal record were merely referred for civil deportation proceedings and freed with their children pending a hearing date in a process called “catch and release.” Since illegal aliens were not monitored in any way, the rate of no-shows for court was predictably high. With no punitive measures in place to enforce compliance, there was no incentive to comply. The policy predictably gave rise to a significant anti-immigrant sentiment. President Trump turned a White House meeting with the National Space Council into a presser to address this very issue on Monday. He directed attention to Democrats and the false assertions that migrant children are being placed in “concentration camps” much like the Japanese internment camps or Nazi Germany. The left maintains that President Trump is merely being racist and cruel refusing to enforce current laws and even advocating for policies that are detrimental to American citizens in favor of illegal aliens. There is a growing rift within the GOP as Republicans fear backlash in the upcoming election when their majorities in the House and Senate could be at risk. Yet is the left’s assertion that the enforcement of immigration policies is merely cruelty and racism by a Trump administration accurate at all? Is the Trump administration merely separating families on a whim? Or is there a legal precedent that predates the Trump administration and a reasoned decision behind this policy enforcement? Facing a national uproar, House GOP leaders included a provision in an immigration proposal that would require families to be kept together for as long as they are in the custody of the Homeland Security Department. The proposed fix won approval from moderate House Republicans locked in difficult re-election battles, but not from Republican Senate candidates running competitive races in GOP-leaning states.